Day 1 of the Changzhou Open Innovation Workshop went extremely well and the team are very pleased with initial collaboration ideas, which have already started to form. 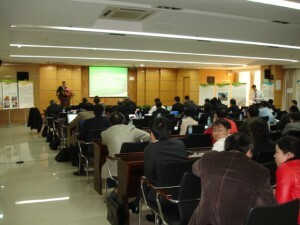 The workshop was opened with a welcome speech by Yue Yang, Director of Changzhou Science & Technology Bureau followed by Yong Hang, Deputy General Secretary of Changzhou Municipal Committee and Linhao Chen, Deputy Director of International Co-operation, Ministry of Science & Technology of China. Mr Richard Mills from the British Consulate in Shanghai closed this formal session. Paul Thorning then invited all UK and Chinese academics and companies to the stage individually to give their presentations. The participants were then asked to write down collaboration ideas, which were posted on each of the delegate’s individual profile posters. These ideas will be used to formulate collaborations in day 2.